It’s one of the more fortunate convergences of the twains that Art Deco and New York City’s first major construction boom in the 20th century occurred at roughly the same time. By the mid 1920s, skyscrapers were beginning to drastically reshape the face of the city, with Art Deco providing the cosmetics. New York hotels, always abreast of fashion, followed suit, bestowing the city with many of its architectural gems. Here’s a round-up of our favorites. Wearing the same grand Art Deco style as Radio City Music Hall, the Hotel Edison draws its name from the inventor, Thomas Edison, who turned the lights on opening night in 1931 (via remote control from his home in New Jersey). Step in the back door from 46th Street and proceed up same mirrored hallway with shiny brass railings as Luca Brasi in The Godfather. The reception lobby it leads continues the motif with murals of New York City in its Art Deco heyday featuring Joe Dimaggio, Cab Calloway and the Rockettes. Upstairs are 900 classic and signature guest rooms and suites with antique style furnishings but all the modern bells and whistles. In the evenings, grab your flapper-wear and Lindy Hop down to the speakeasy-flavored rum bar for some dark and stormy runs by the piano player. Rooms start at $250 a night. Book online through Hotels.com. When the New Yorker Hotel opened in 1930, it was the city’s largest hotel with 2,500 rooms and its own coal-fired power plant in the basement to keep the lights bright. Today, it’s administered by Ramada, carbon neutral, and sporting “only” about 900 rooms divided into four types of rooms and two types of suites. All blend modern amenities like flatscreen TVs, free Wifi, and Simmons Beautyrest mattresses with an “extra touch” of Art Deco style. The hotel’s main lobby has even more, especially in the enormous chandelier, elevator doors, and font-lover’s dream signage. Perhaps the ultimate tribute to one of Art Deco’s original inspirations can be paid in room 3327, where Nikola Tesla died. Book online at the website or Hotels.com. Although built in 1904 in a beaux arts style, the Carlton hotel is replete with the Art Deco spirit, especially after undergoing a multi-million dollar transformation several years ago led by world-renowned architect and designer David Rockwell. 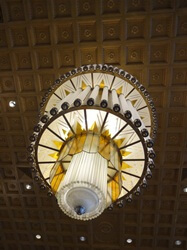 In addition to the updates in the 317 luxury rooms; which include tall leather headboards, dark walnut trim, and mirrored furnishings; the vaulted main lobby and lounge focus attention on a large print of an early 20th century street scene flanked by two enormous, cushioned art deco pillars. 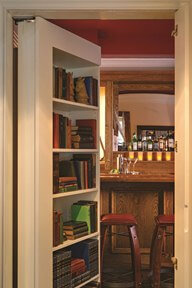 Perhaps nowhere is the hotel’s speakeasy heritage more visible than in the Speakeasy suite, complete with a hidden back room accessible through a bookcase. Inside, the era of Art Deco comes alive with a poker table, small bar, and photos of flappers and G-men. Rooms start at $250. Check prices online at Priceline. 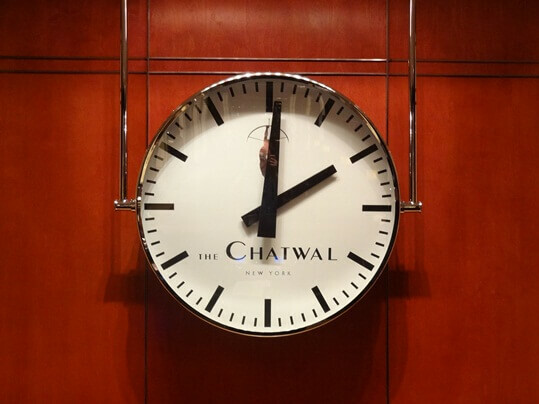 The gleam of the polished main lobby of the Chatwal hotel almost blinds you with its passion for Art Deco, as if a Hollywood golden age cameraman laid a permanent gauze over the scene. The Stanford-White building; originally opened in 1905 as the headquarters of the country’s first professional theatrical club, the Lambs; today houses an entirely redesigned interior by Thierry Despont, with 76 luxury guestrooms that show plenty of Deco flair in jewel-toned glass, suede walls, leather closets, and even custom-made Chatwal playing cards and backgammon set. You can even smell Art Deco in the house perfume, The Chatwal No. 44, created by Krigler. Rooms start at $650 per night. Compare rates at Hotels.com and Priceline.